Photo courtesy of Blue Cloud Movie Ranch website. 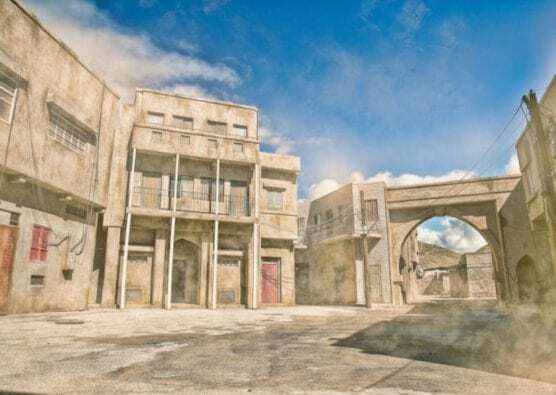 Attendees at the 2019 Santa Clarita Cowboy Festival, presented by California Resources Corporation, will have a new opportunity to see some of the most iconic sets in recent film history. In partnership with Blue Cloud Movie Ranch, the Cowboy Festival has added a new event to its lineup – the Blue Cloud Ranch Tour – on Sunday, April 14, 2019. Step out of the Southern California sunshine and into sets depicting Baghdad, Iraq, a U.S. Army base, a mission-style church and much more on the 250-acre film lot. Tucked into the hills of Santa Clarita, Blue Cloud Movie Ranch has been the backdrop for productions such as “American Sniper,” “JAG,” “True Blood,” “Iron Man” and dozens more. Join other Santa Clarita Valley residents and visitors as film historians E.J. and Kim Stephens guide you through this fascinating film ranch that has never been open to the public before. Please note that due to the nature of the venue, there will be extensive walking and closed-toe shoes are required. Space is limited, and tickets are expected to sell out quickly. The tour will take place on April 14 from 1:00 p.m. to 5:00 p.m., and tickets are on sale now for $60 per person. Attendees will meet at the Cowboy Festival Shuttle Site (Railroad Avenue and 13th Street in Newhall) and take a bus to the movie ranch. For more information about the Blue Cloud Ranch Tour, and to purchase tickets, please visit cowboyfestival.org/schedule.